I hope Astrovision Bacolod has a copy. Then we take what we get. Yay! I watched this only halfway last night. Time to finish it tonight! Dan, was the film in chronological order? And the foreplay between Maya Valdes and Robert Antonio in the falls included? this is great news... will drop by ASTRO today. Hopefully, they have it already. Who's the guy they got to dub over Joel Torre again? just got a copy at Astro megamall for P299. any news if Maynila sa Kuko ng Liwanag will also be released on DVD? The most complete one was Peque's copy with original subtitles translated by Joey Reyes. Its grainy, needs to be clean painstakingly. Don't know the exact running time, though. Though the print is marred by dust, particles and scratches, the print is at least watchable. The colors are also pretty good. The dialogue gets muffled in a few scenes. No widescreen version. Even the one with original subs shown at the MIFF in 1983 its in 1.33:1 aspect ratio. Its good that they finally release it on dvd format. In that case, I will get one the next time I visit Astro. Peque can now dispose his own copy with orig subs. Based on the screenshots posted by Dan, the video looks pristine. Can't wait to ave my copy. Sana available na to sa Odyssey stores. just finished viewing the entire movie. It's a good thing there are English subtitles because the dialogue gets really muffled in several scenes. The movie is really good though. The complete running time runs 203 mins! Just been to Astro Podium. Title is out of stock. there are still a couple at Odyssey Alabang Town Center, for peeps in the south. sa astro megamall madami pa rin. It's time for the good times. Forget about the bad times. Thanks guys. Hope to catch one when i'm there this weekend. Just dream for the Special Edition right now. The people behind the production team which includes Peque Gallaga, Rody Lacap (cinematography), Don Escudero (production design), Jess Navarro (editor) are willing to contribute for the retrospective docu without charging a single cent but the dvd has been released now! 1. When compared to the DVD re-release of Himala, the packaging of this disc is far superior. The front and back covers contain proper information on cast, crew, story, special features, and technical specs. I would have preferred an Amaray case, but it's on standard Star Cinema digipack packaging. At least it now has a proper hub for the disc, not just a foam stopper. One minor gripe: I wish their proofreader would have caught that the term is "remastered" and not "re-mastered." It just looks silly on the cover and spine. 2. The picture is widescreen anamorphic; it's a lot cleaner than the old release - no more debris and artifacts visible. Still not that sharp, though. I'm thinking maybe this was really how the film was shot. The audio is also significantly better than that of the previous release, which had issues with the sound being almost inaudible during a few scenes. 3. It has proper on/off subtitles. 4. The special features are interesting in that it has two audio commentaries, one by Peque Gallaga alone and another by Peque and some of the main cast (including Joel Torre, Cherie Gil and Fides Cuyugan-Asensio), and also two other features: Actual storyboards of the fight sequences in the film, and a scrolling version of Peque's original story treatment. I've never seen such features on a local disc before. I'd consider this a perfect release if they had included even a brief restrospective documentary. Too bad that they didn't film one, since they had assembled the cast together anyway for the commentary recording. Also, footage from the restoration premiere when the cast went up onstage before the film would have been a nice bonus. On the whole, Oro Plata Mata has never looked nor sounded better on home video. This is a must-have in my book. Aw man, I was just at Astro kanina. Should have looked for this. Thanks for the heads up! ^^ Time to upgrade my old DVD edition. Thanks for the information & review! Got a copy at Astro Southmall. Watching this later. sana isinama nila ang Inside the Cinema interview ni Peque Gallaga sa Cinema One. may part na kasama si Cherie Gil doon at nagkukuwentuhan sila tungkol sa shooting ng movie. Got my copy yesterday from Astro SM Marikina. Thanks for the heads up, Mr. Hankey. Picture quality is a big leap from the previous dvd release. Pristine video and yes this is OPM as you've never seen or heard before. The commentary of Direk PQ was insightful and lots of tidbits about the film. Kudos to Star Home Video for a job-well done! My only minor gripe is the cardboard packaging. 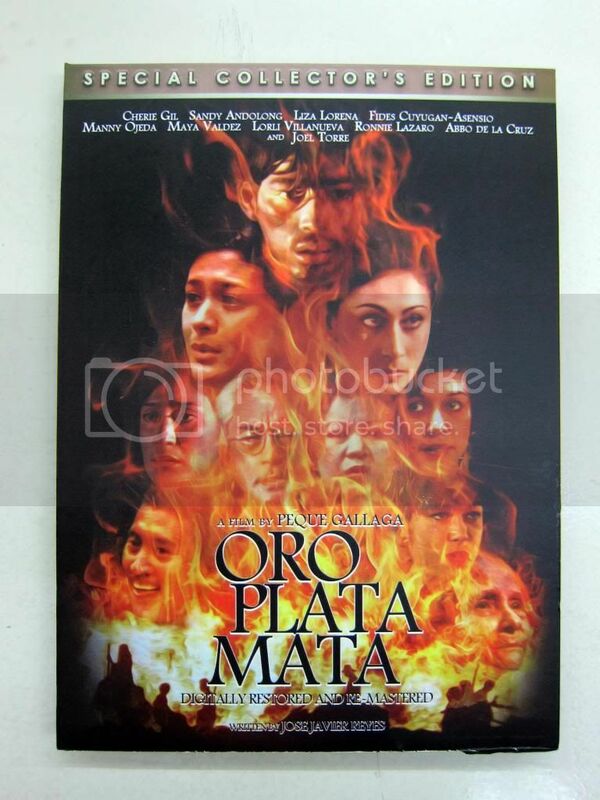 just bought a copy of ORO PLATA MATA last week at SM Molino-Astrovision.